This antibody also reacts with bromodeoxyuridine when incorporated into nuclear DNA. It cross reacts with iododeoxyuridine (IdU). Chemical/ Small Molecule conjugated to BSA. Our Abpromise guarantee covers the use of ab8955 in the following tested applications. Using immunocytochemistry, a combination of this antibody and Mouse monoclonal to Mitotic Cells (ab8956) can distinguish and quantitate the four major fractions of the cell cycle. IHC-Fr 1/100 - 1/200. ABC method. IHC-P 1/100 - 1/200. ABC method. 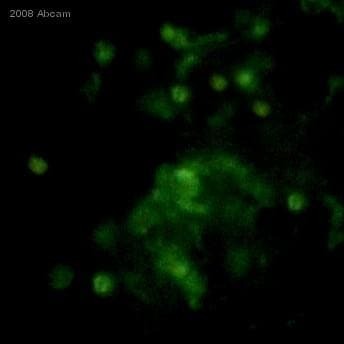 Indirect immunofluorescence staining of BrdU-labeled MR65 lung cancer cells with ab8955. BrdU staining in sponge Halisarca caerulea using ab8955. Metacrylate embedded tissue sections were incubated with 1:200 diluted primary antibody. An avidin-biotin complex kit using biotinylated rabbit anti-mouse antibody and then incubation in avidin-biotin-peroxidase complex was used for detection. 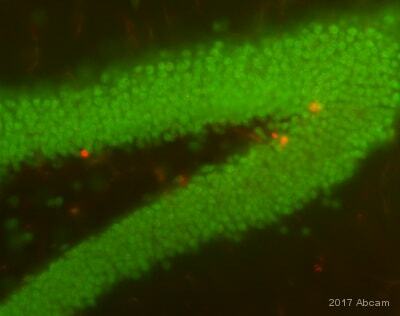 BrdU staining in paraffin embedded rat intestine using ab8955. Primary antibody diluted 1:200. Peroxidase-conjugated goat anti mouse secondary antibody was used for detection. Flow cytometric BrdU-DNA cell cycle analysis in a lung cancer cell line. Dilution 1:100 of primary antibody ab8955. FITC-conjugated goat anti mouse secondary antibody was used for detection.